Heidi Mulvey, Community Engagement Manager at Cambridge University Press (CUP), came to us looking for a board away day with a difference. CUP wanted to get involved with a community activity where their board members could use their expertise to make a difference to young people. 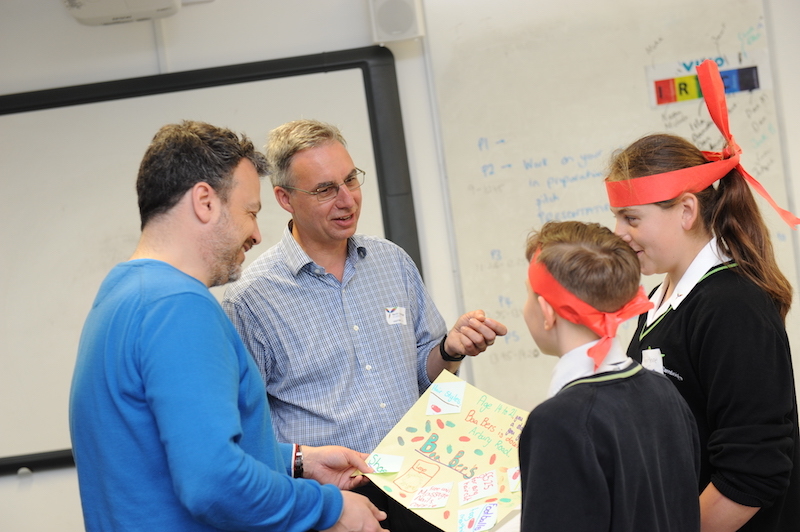 Given that the directors represented all the skills required to run a successful business, Form the Future CIC suggested they take part in an Enterprise Day at North Cambridge Academy (NCA). The Enterprise Day is an event from Form the Future CIC that introduces students to entrepreneurship across a variety of industries. Teams of students from NCA were tasked with developing a new product or service, while the CUP volunteers worked with them to hone their business ideas and craft a pitch. The aim of the Enterprise Day was to get the Year 8 students (aged 12 and 13) to learn what’s involved in running a business. It was also a chance to be creative and develop skills such as teamwork, problem solving and communication. The board members from CUP acted as business mentors throughout the day, working alongside the teams of students to highlight the skills and behaviours that lead to success. The task was fun, challenging and difficult at the same time. Overall, it was an exciting experience and we hope this happens again for the next set of Year 8’s! Four teams were selected by the board members to progress to a Dragon’s Den-style finale. The overall winner was a business proposal for Animology, a service developing products such as hearing aids and prosthetics for animals. Such events, either following a tried-and-tested format or completely tailored to an organisation, enable businesses to engage with the next generation of potential recruits, share their knowledge and passion, and make a positive impact in their community. It can also be an excellent team building activity. In this particular case, we were able to involve senior executives from CUP who wouldn’t usually have the time to volunteer or the opportunity to engage with young people. Peter Phillips, Chief Executive, said that they all found the experience very rewarding, as it encouraged them to reflect on their own work and gave them new insights into today’s educational landscape, which could inform their future offerings to schools. The students’ presentation skills were excellent, they were confident and I was so proud to see the support they showed each other. If you are looking for a way to work with schools and young people and make a difference like CUP did, please get in touch. We can help you to connect young people to a world of career possibilities, inspire them to dream big and empower them to fulfil their potential.